The family-friendly massively multiplayer online magic dueling game Wizard101 from KingIsle entertainment expands today, with a new PVP arena and Dragonsprye, a new high-level world for players to battle in. 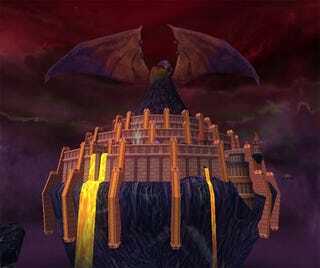 Dragonspye is an ancient, haunted world with a magic Academy of its own, rivaling the Ravenwood School of Magical Arts in Wizard City that features prominently in the main game. Death Magic professor Malistaire has been spotted there, and players who venture into the new land will soon learn the truth behind his sinister plans. Insert evil laughter here. Along with the new land in the introduction of a new PVP Wizard Areana on Unicorn Way, where players can face off against each other in practice and ranked duels. While ranked duels will be exclusive to paying customers for a few weeks, non-paying members will gain access in mid-February. Plano, Texas - Jan 20, 2009 - Dragonspyre is a high level world that continues the storyline of online game Wizard101 (www.wizard101.com) beyond the Feudal world of Moo Shu populated by "Samoori" cows. The new environment, Dragonspyre, is an ancient haunted world where renegade Death Magic professor Malistaire has recently been spotted. Once an advanced militant society, Dragonspyre had an esteemed Academy rivaling that of the Ravenwood School of Magical Arts in Wizard City. It is a dark world where the inhabitants held a special interest in Fire Magic. Players will face challenging new battles, and ultimately discover the truth about Professor Malistaire's sinister plans. Diego the unicorn is the gatekeeper to the new PvP Wizard Arena in Unicorn Way. Players can challenge each other in either Practice or Ranked duels, with up to four Wizards per team. Un-Ranked practice duels, free for all Wizard101 players, allow players to jump into an automatically formed duel or set up their own team and choose opponents. In Ranked duels, a robust matchmaking service matches Wizard101 subscribers with similarly ranked Wizards, and the winners of each duel are awarded Arena Tickets, redeemable for unique loot. Ranked duels will be an exclusive subscriber benefit for the first few weeks in the Wizard Arena. In mid-February, non-subscribers will also be able to participate in Ranked duels for Crowns. At the end of each quarterly Wizard Arena season, a top Duel Master will be named.